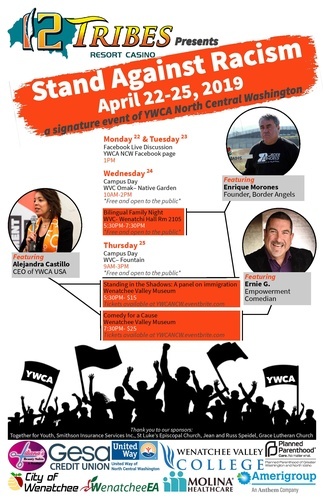 YWCA NCW and 12 Tribes Resort and Casino is partnering with Wenatchee Valley College to host the 5th annual Stand Against Racism week at Wenatchee Valley College, April 25, 2019 9:00 AM to 3:00 PM. Join YWCA NCW, and their sponsors for community campus day. A day of compelling celebrity speakers, educators, food, art, and immigrant justice action. Hosted at Wenatchee Valley College, 9am to 3pm. No cost to the public.